A new way to weigh the mass of distant alien worlds could help reveal key details about how friendly they may be to life, scientists say. In the past two decades, astronomers have confirmed the existence of more than 900 planets outside the solar system and discovered more than 2,300 potential worlds. Now, instead of just detecting these exoplanets, scientists want to analyze them in detail, helping answer questions such as whether they are potentially habitable. "The mass affects everything on a planetary level," Julien de Wit, a researcher at MIT and the study's lead author, said in a statement. "If you don't get it, there is a large part of the planet's properties that remains undetermined." However, current methods for weighing exoplanets are limited. The main technique scientists use now is radial velocity strategy. This method looks for repeated wobbles in a star's movements, which are signs of a planet's gravity yanking it back and forth; a planet's gravitational pull is linked to its mass. The problem is that the radial velocity method does not work on a large variety of worlds that do not visibly tug much on their stars. This includes planets with low masses, those orbiting a fair distance away from their stars, those around faint stars, and those circling highly active stars where a planet's tugging can be masked by disturbances on the star. Now, scientists have developed a strategy to weigh a planet just by looking at its atmosphere. To understand how this method works, imagine that an exoplanet's atmosphere gets thinner with altitude, just as Earth's does. This is because the strength of a planet's gravitational pull weakens the greater the distance from the planet. To test this method, known as MassSpec, the researchers applied it on an exoplanet known as HD 189733b, a world about 63 light-years away from Earth discovered in 2005. The estimate they calculated for its mass closely agreed with estimates calculated via the radial velocity technique: about 1.15 times Jupiter's mass. Currently, MassSpec only works on gas giants — worlds about the size of Jupiter and Saturn, the researchers said, adding that this method could help pin down the mass of gas giants whose stars are too active to allow mass estimates via the radial velocity method. If and when space telescopes such as NASA's James Webb Space Telescope and the European Space Agency's potential Exoplanet Characterisation Observatory (EChO) launch, MassSpec will be able to weigh planets with a mass about the same as Earth's; super-Earth planets with a mass of up to 10 times Earth's mass; and gaseous planets known as mini-Neptunes that have a mass of up to 10 times Earth's mass. 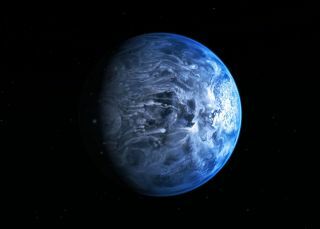 "We now have a method to get the mass of Earth-sized planets that are far enough from their stars to be potentially habitable," de Wit told SPACE.com. "We show that our method could be applicable to potentially habitable Earth-sized planets within the next decade." De Wit and his colleague Sara Seager detailed their findings in the Dec. 20 issue of the journal Science.